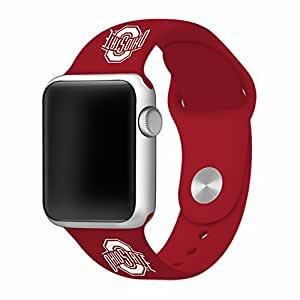 Collegiate Watchband for Apple Watch Collection is made using durable silicone and stainless steel. The soft silicone provides a smooth comfortable feel and the pin and tuck closure ensures a clean fit. The school logo provides a nice contrast with the band while showing your school spirit. AVAILABLE SIZES – We offer both 38mm and 42mm widths in all of our Apple compatible bands. The silicone bands are shipped as a three piece set that allows for a large range of wrist sizes. Our stainless steel bands are one size fits all by using a magnetic clasp. DURABILITY – Although our bands are made with a durable logo printing process, there is still a chance that the logo will fade with active contact. We offer a one year warranty for the silicone bands. OFFICIALLY LICENSED – These bands have been submitted and approved by each college or university. These are compatible with the Apple Watch but are not genuine Apple bands. Licensed product of the Collegiate Bead Company – “the indicia featured on this product is a protected trademark owned by the respective college or university” NOTE: Stainless will scratch over the first few months of wear but will eventually take on an even matte finish.